Wanlop Sitpholek, the infamous tattooed man of Muay Thai fights Yucel Fidan in the 2nd fight of the S-1 tournament of 2004. 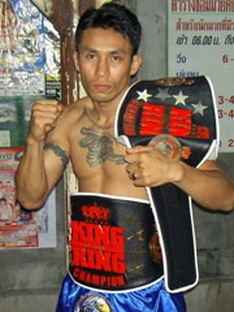 Wanlop would fight often international winning the King of Rings title and fighting Australian Standout John Wayne Parr. ~ by fatsoking on February 11, 2011.